Review posted April 27, 2014. Recorded Books, 2006. 8 CDs. I started the Isabel Dalhousie series years ago, but lost interest. Now I've discovered the way to read them -- on audio, when one can be entertained by the lovely Scottish accents. It's misleading that these are shelved in the mystery section, because they're not traditional mysteries. Yes, a crime occurs -- in the last part of the book, on the last CD. But Isabel doesn't solve it, she philosophizes about it. Isabel is a philosopher, independently wealthy, and the editor of an ethics journal. She keeps saying that she thinks too much, but the listener does enjoy the digressions which her thoughts take. In this book, most of her musings are about her relationship with Jamie, a man 14 years younger than her, whom she has fallen in love with. So she thinks about every possible side of the ethics of that relationship. And Jamie was once the boyfriend of her niece Cat, so there's that to consider as well. Meanwhile, Isabel's cousin Mimi and her husband are visiting, and the whole group is invited to a house party given by a wealthy Texan and his fiancé. But is the fiancé just after his money? That's what it seems like to Isabel. 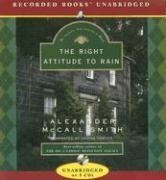 Alexander McCall Smith's books don't have a plot that progresses at a rapid pace, and I think that has a lot to do with why I stopped reading this series. But listening to it in the car on the way to work and back is a delightful way to approach it. I find myself smiling at each new diversion and thinking about the philosophical implications during my day, but I haven't had too much trouble shutting the car off when I get to work. (There were a couple times...) This book makes a pleasant travel companion, and I'm going to be quick to take up the next book in the series.